Mont Blanc is the highest mountain in Europe and is notorious for its frequent, sudden changes in weather conditions—just one of the reasons why it ranks among the deadliest mountains in the world. To explore the weather conditions on top of the mountain, the Aosta Valley Environmental Protection Agency (ARPA VDA) and Ev-K2-CNR decided to install a Campbell Scientific weather station near the summit. The selected site is located on the Italian side of the mountain at 4,750 m (15,583 ft) above sea level. Ev-K2-CNR is well-versed in installing monitoring stations in mountains, and the Regional Agency for the Protection of the Environment of Aosta Valley (ARPA VDA) is an expert for all regional conditions. Europe’s highest weather station has to fulfill a wide range of requirements. The system has to withstand very extreme conditions in this harsh, remote environment. Because of its inaccessibility, the station needs to be low-maintenance, and the data needed to be collected remotely. The station is powered by two solar panels giving a total of 120 W and two back-up batteries. The low power has been designed to have sufficient energy capacity even during long periods of winter fog. To fulfill all of these needs, system integrator Hortus chose the Campbell Scientific CR3000 Micrologger with an extended temperature range as the basis of a weather station. The datalogger measures a full array of parameters, including atmospheric pressure, air temperature, relative humidity, wind speed and direction, direct and reflected solar radiation, snow depth, and solid and liquid precipitation. A webcam provides real-time images of the summit of Mont Blanc. All collected data are periodically transmitted through a GPRS connection in near real time. The meteorological parameters are visible on the ARPA VDA website. In addition, the station is equipped with the Iridium satellite telemetry system, which enhances the transmission reliability of the most important parameters, even if temporary interruptions in the cellular network occur. The project began in 2014 when the foundations on which the station now sits were laid. The difficult weather conditions in autumn that year postponed the station installation. All sensors were preinstalled before the station was transported from a hangar in Courmayeur to the site by a helicopter. The flight operation of the helicopter was complex and spectacular. 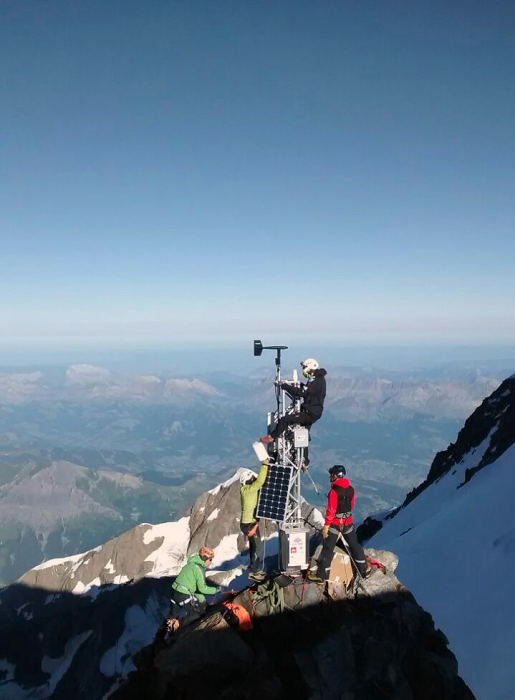 The station, built onto a sturdy aluminium trellis, was finally installed in July 2015, 70 m (230 ft) below the summit of Mont Blanc. The collected data provides important information and will contribute to increase the safety in the mountains over the years. Ev-K2-CNR, as an autonomous, non-profit association that promotes scientific and technological research in mountain areas, already plans to install further stations in this region and also worldwide.